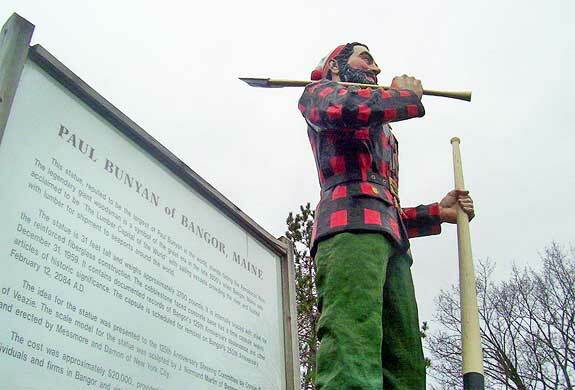 The City of Bangor's Paul Bunyan statue, at 31 feet tall, is purported to be the largest in the world. Image courtesy of SarekOfVulcan. Creative Commons Attribution License. A loaf of crusty bread, a wedge of tangy cheese, perhaps a bunch of fragrant red grapes, all of these are temptingly portable foods that beg to be enjoyed in any of Maine’s countless picnic areas. Even Interstate 95 calls its rest areas “Welcome Centers” because they do indeed invite you to stop a while and enjoy a meal at their onsite picnic areas. City parks, state parks, beaches and Acadia National Park all have places to pull out a checkered tablecloth or a blanket and set out a feast. Load up the car, point it in any direction and find the outdoor dining room of your choice. Visitors to Fort Kent State Historic Site will find picnic tables with a view. Built to guard Maine’s northern edge, the fort played a role in the border dispute between Canada and the United States. In 1839 the fort was headquarters for what was known as the “Aroostook War” and housed officers guarding that disputed boundary. Learn how this “war of words” was resolved by touring the onsite museum. Dine overlooking the lazy curve of the St. John River. Entry to the Fort Kent Blockhouse currently is $1 to $3, depending on age and residency. Parking is free and close to the picnic areas. The town of Fort Kent also has a number of neighborhood parks with picnic areas. Riverside Park sits on the St. John River, off of East Maine Street and is a mixed use park with a small campground, hiking trail, picnic area, boat ramp, basketball court, soccer field and a children’s playground. Jalbert Park fronts the Fish River, which doubles in winter as an ice skating and snowshoeing venue. At the end of South Perley Brook Road is Little Black Lake, offering a boat launch and picnic area. All of these are free to the public. Within the roughly 47,000 acres of Acadia National Park there are more than a few picnic spots available for your dining pleasure. Some of the most scenic include Bear Brook, Fabbri, Frazier Points, Pretty Marsh and Seawall. The latter is a natural rock sea wall with an adjacent campground. Bass Harbor Head Light, on Mount Desert Island’s southern tip, offers al-fresco picnic opportunities on the rocky shoreline. The lighthouse has free parking but you do need to climb over the rocks to get a good view of the light. The red and white stripes of the West Quoddy Head Lighthouse provide the perfect backdrop for a cliff-top picnic at Quoddy Head State Park. You are so high up that you can see fishing trawlers plying the horizon and even whales spouting in the distance. The lighthouse itself has a visitor’s center, gift shop and museum and admission is free. Quoddy Head State Park charges between $1 and $3 as an entry fee, depending on residency and/or age. The park is open year round and the lighthouse from Memorial Day until mid October. The visitor’s center is accessible to the physically challenged, but getting to some of the picnic tables could prove difficult for some. Peaks Island sits three miles from downtown Portland, in the middle of Casco Bay. Reachable by ferry or private boat, this was once the haunt of movie stars, directors and others in the entertainment business. Jean Stapleton (Edith Bunker on “All in the Family”) and Martin Landau (Mission Impossible) both made their onstage debuts at the island’s Greenwood Garden. This artsy locale also brought George M. Cohen north from New York to try his theatrical creations out before opening on Broadway. Today the island draws people to its antique stores, boutique outlets and to open spaces that are part of the Peaks Island Land Preserve. Battery Steele, a 14-acre preserve on the National Register of Historic Places, was once part of the Peaks Island Military Reservation. It is now a pleasant place for a hike or an impromptu picnic overlooking the bay. Other open spaces in the preserve include Parker Preserve, three-acres of native forest land criss-crossed with hiking trails, the Backshore, with hiking trails along a mile and a half stretch of the island’s eastern coast and Ballfield Woods, offering trails through a hardwood forest and a community ball park. With the exception of the ball park there is little development. Picnickers must carry all they need in and garbage out. Use of the parklands is free. On the mainland, Fort Allen Park and the Eastern Promenade sit on Munjoy Hill, offering views of Casco Bay and several of the offshore islands. The fort is a National Historic Landmark, dating back to 1814. Pathways lead past Civil War cannons and various memorials. Strategically placed benches offer the best views. Summer concerts are held in the bandstand, fronted by a large grassy area. Enjoy your picnic with a little music on the side. Belgrade Lakes is home to a number of waterfront parks, some with scenic picnic locales. Peninsula Park, on Long Pond is in Belgrade Lakes Village off Route 27 near the dam. It offers picnic tables surrounded by trees, some with lake views. Restrooms are available. Boat Landing Park on Messalonskee Lake offers a public boat launch, picnic area, restrooms, a playground and ample parking. It is on the northern end of the lake on Old Belgrade Road. Pleasant Point Park, on McGrath Pond, offers a public beach, playground, restrooms and a large grassy field. A number of outfitters offer canoe and kayak rentals, some even delivering to your picnic or camping spot. If you’d like to combine your picnicking with some white-water action, visit the Forks. This is where the Kennebec and Dead Rivers meet. Outfitters offer half and full day raft trips that include a picnic lunch, as well as multi-day trips that offer camping in the back-country. One way to combine a picnic with an all-day outing is to take the self-guided Rangeley Lakes Scenic Byway Tour. Get to the valley overlook called Height of Land early to take in the sunrise before heading north on Route 17. Once in the town of Oquossoc, take some time to enjoy Mooselookmeguntic Lake, perhaps with a bit of fishing, kayaking or a hike on one of the many trails. Then travel east on Route 16 to visit the Rangeley Lakes Region Logging Museum before heading to Smalls Falls for your picnic and a swim. Hike to the top of the falls for a birds-eye view of the gorge. After this head for Madrid, two miles east of the falls along Route 4, perhaps for dinner or to spend the night. This family-friendly outing is fun for all ages, and except for the hike up the falls, accessible to most. Rangeley Lake State Park is nearby and offers campsites and more places to picnic. Camden Hills State Park is the largest open space in the Camden area and it offers over 30 miles of hiking pathways winding through the coastal forest. In the fall the red and gold of the trees provide a stunning contrast with the blue of Penobscot Bay. From the top of Mt. Battie you can see as far as Cadillac Mountain in Acadia National Park. Mt. Battie’s top also has a large flat granite area where you can picnic while overlooking the ocean. Camp overnight or take advantage of the day-use picnic area, located near the parking lot. The walk to the day-use picnic area is a bit steep. Park user fee is $1.50 to $3 per person depending on age and residency status. This is a great park to do a bit of bird-watching. In the heart of Camden is the Camden Harbor Park & Amphitheatre. Tiered steps enclose a large circular lawn where summer concerts and town celebrations are held. The tiers are large enough to hold picnic tables, scattered under hardwood trees. This is your chance to picnic in a park that was a backdrop for the television show “Peyton Place.” The park is on Atlantic Avenue, off Route 1, and there is a wheelchair accessible entrance. How about a picnic at the zoo? York’s Wild Kingdom, in York Beach, offers a zoo, a Butterfly Kingdom, mini-golf course, arcade, carnival rides, water park and a haunted house. Short Sands Beach is a quick walk away. Designated areas are available for you to enjoy your own picnic or some of the onsite carnival-style food. Open the end of May until the third week in September, ticket prices vary according to age and if you want just the zoo ticket, the zoo/rides ticket or individual ride tickets. Pony and Go-Kart rides are also offered. A more nature-minded alternative is to rent a kayak in Lincolnville and paddle out to Warren Island State Park, about three miles from the mainland. There are nine primitive campsites in case you want to spend the night, but even a day trip gives you a chance to unwind. Open from Memorial Day until mid-September, this is a true bird-watchers paradise. Ospreys do nest on the island and they don’t usually mind visitors as long as you keep your distance. If you spend the night you might hear the Great Horned Owls hooting away. The southern end of the island has a small swimming beach and though the water is cold it is remarkably clear. Drinkable water is available, but you’ll need to bring everything else with you, and carry trash out. Pit toilets are available near the campsites. This is picnicking in the great outdoors, just you, an occasional human and plenty of birds. Peaks-Kenny State Park is one of the highlights of the Maine Highlands Region. It wraps around the South Cove of Sebec Lake and offers 839 acres of hiking, biking and paddling enjoyment. A day use, grassy picnic area is leads to a sandy beach. Tables, barbeque grills and restrooms are easily accessible. An additional campground is about a five minute walk to the beach. The park service center is open from May 15th through the end of September but the park is open daily almost year round. During the winter, ice-fishermen picnic in the snow in-between angling for fish. Park use fees are from $2 to $6 depending on age and residency. The park is at the end of the Peaks-Kenney Road near Dover-Foxcroft. Bangor, Maine has over a dozen parks within its boundaries, most of them with picnic areas. Bangor Gardens Park offers a playground and basketball hoop. In winter part of the park is turned into an ice rink. Bass Park is one of the largest and in July hosts the Bangor State Fair. The Grotto Cascade Park is one of the most beautiful, with picnic tables scattered on a broad expanse of lawn surrounding a large fountain. At night the cascade of water is backlit, adding a romantic touch. Then again you could have your picnic in Paul Bunyan Park, breaking bread with a 31-foot tall statue of the folk legend, red plaid shirt, giant axe and all. A skateboard park is available and during the summer the Bangor Band holds a concert on Tuesday evenings in the park gazebo. This is probably one of the easiest parks in Bangor to find, just look up for the smiling face with the full beard and shock of black hair, occasionally decorated by a daring bird or two.